In part I, we got our servers up and running. Just in case here is How To Install LAMP / LEMP Ubuntu 14.04 LTS Production Server. In Part II, we configure Apache and its modules. The first step is to ensure that Apache server is running well under default settings and the easiest way to do that is to navigate to server’s IP address using your browser. 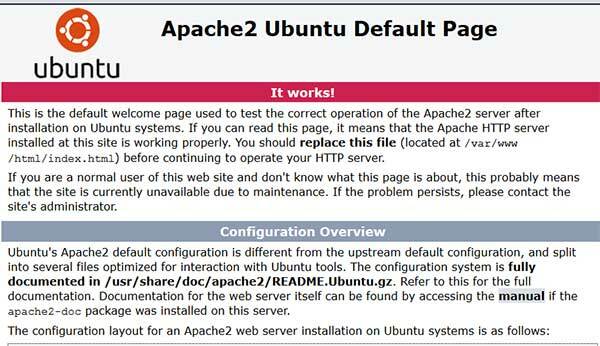 It would load Ubuntu’s default Apache web page (screenshot below). In Ubuntu, the main configuration files for Apache are located at /etc/apache2, with the following directory structure. Lets go through each config file and their functions. apache2.conf is the main configuration file that brings together all the different configuration files for the web-server. In-fact, you can have all your configuration done here ( don’t do it ). ports.conf configures the port that the virtual host listens to for incoming requests by default port ’80’ for normal and port ‘443’ for SSL. It must be included into apache2.conf. conf-enabled contains symlinks of enabled configurations. Apache Modules – these are pieces of software that adds functionality to Apache server. A typical Apache web server will come with a common set of modules pre-installed which could be seen using the following command. mods-enabled contains symlinks of enabled modules. mods-available contains all the available modules that can be added to your Apache configuration. Here are some handy commands to help you install, enable, & disable Apache modules. Note that you might need to download your module first before you could install. Download sources could be found modules documentation. Now, that we have a idea on the bits and bottles that make up the Apache configuration lets have a closer look at the main configuration file. The file contains directives for resources, processes and virtual hosts. Section to include mods-enabled and conf-enabled configuration files along with other additional resources. MPM extends the modular design of Apache using multi threading. This provides improved performance and scalability for modern web applications with minimal resource footprint. Even though Apache comes with several MPM modules like Event and Worker, one needs to install and then compile Apache before usage. If you are on Apache 2.4.X then MPM Event is your best bet with Apache moving its status to ‘Stable’ in Apache 2.4.X from ‘Experimental’ in Apache 2.2. If the module has been enabled you would see configuration details in the main apache2.conf file. Make sure you tweak the settings according to your needs. The time out options defines the time Apache waits for a request.The default setting at ‘300’ seconds is too high in most cases and could be reduced to ’60’ or ’90’ seconds. This option directs Apache to keep HTTP sessions alive for stipulated time. This reduces the need for multiple TCP connection which in turn reduces latency. It’s important that you enable this option by setting it to ‘On’ to have a good server response time. and work your way up or down depending on your needs. Number of seconds Apache will wait before ending connections. Keeping a high threshold timeout can reduce performance if there are resource bottlenecks, as it uses resources to serve idle connections. So, striking a balance between performance and resource usage is key. Virtual hosts allow multiple sites to be hosted on a single Apache server.The default virtual host file for Apache document root is located in sites-available directory. Similarly to grant access control for hostnames. The default virtual host file is configured to listen to port ’80’ and serve webpages from the default public directory at /var/www/html on every request but the default settings can be overruled using additional virtual host files and their settings for creating virtual servers. Often Server Alias directive is used to create name-based virtual hosts.Example name-based virtual host configuration file. Apache needs to be restarted for the changes to take effect. We have moved a little closer in getting our production server ready by configuring HTTP server. We still don’t have an optimised server but that’s a separate tutorial by itself.We configure PHP and MySQL/MariaDB in the next couple of tutorials. © 2010–2014 Smartpixels, Inc. All rights reserved.